Adam had a fantastic dream that he was so terribly excited about that I got to hear all about it. In great detail. Like, a lot of detail. Just like the rest of his stories. And I mean a lot of detail. What was his dream about? Pretty much you can read the words yourself, you lazy bum. 🙂 Kidding. But really, it’s all right there. This is actually the abridged version but I think you can get the idea. The point was that I was very concerned for dream-Adam’s safety that he was going to cut his hands. In my earnest demonstration of love and concern for his well being I was told (a bit condescendingly if I do say so myself) that it was just a dream and that it would be silly for his hands to get destroyed by shark teeth. Can you blame a girl for being concerned? See if I care the next time he encounters a shark. 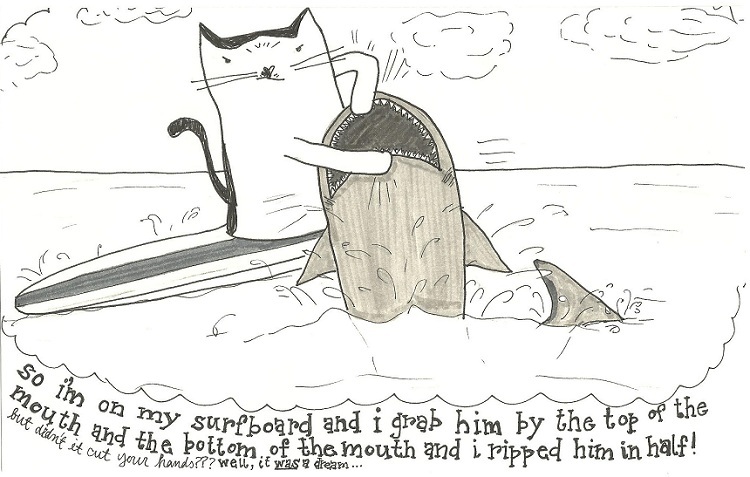 This might be a legitimate issue at some point because Adam does love sharks. All I can say is that I hope he does get to rip a shark in half and tell the tale. Then he can use as many details as he wants and I won’t mind that time. Maybe. And I just thought of something. For a guy who loves sharks so much and supposedly knows so much about them, you’d think the facts would properly manifest in his dream. Maybe someone’s been a pretend shark lover this whole time. My marriage is a sham.